One of my recent posts, on Svarowski crystal flooring at the Domotex 2008 show provoked a whole "how do they do that?" storm so I thought I'd look more closely at the flooring. 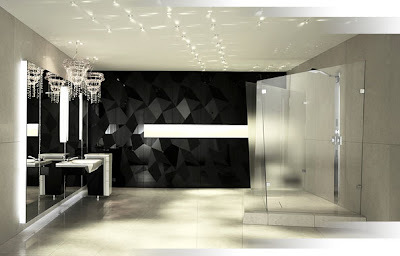 The floors tiles are produced by Diametral Concepts in Glass, an Austrian company that uses a layer of Swarovski crystal mesh between two layers of glass, sealed with a patented glue so it always stays sparkly. It's superbly suited to hotels, nightclubs and casinos where the night lights show off the crystals to their best advantage. Diametral are pretty stingy with their images. For the moment you would have to visit the Gulf Countries or their website to see a stunning Barbie pink example, but a casino floor in Vegas may be swarovskied in the near future. Of course you may want that touch of bling elsewhere in your house and Swarovski crystals can be used in many other architectural applications. Want an entire cystalized bathroom? Walls, lighting, faucets can all sparkle as in this bath by Kludi. Maybe your kitchen appliances are looking ordinary? You could step up for the Swarovski crystalized fridge-freezer by Gorenje. Really, no room needs to be left bare - and I'm sure your milk and eggs will taste much better if they are stored in a crystal-studded refrigerator. The frig looks like it should be on MTV's Cribs. That is just fabulous. I'll do my whole house in it.